Sweet Times in the Rockies Cake Competition returns to the Colorado Fall Home Show. This year's theme will be fairytales! 9NEWS is a sponsor of the Colorado Fall Home Show. The content of this article provided by Colorado Garden Foundation. The Colorado Fall Home Show is first and foremost a marketplace for remodeling, refreshing and renewing your home, but it doesn’t end there. The Show also celebrates the sweet treats that come out of our kitchens, and will once again host the Sweet Times in the Rockies Cake Competition during the show. What is Sweet Times in the Rockies Cake Competition? 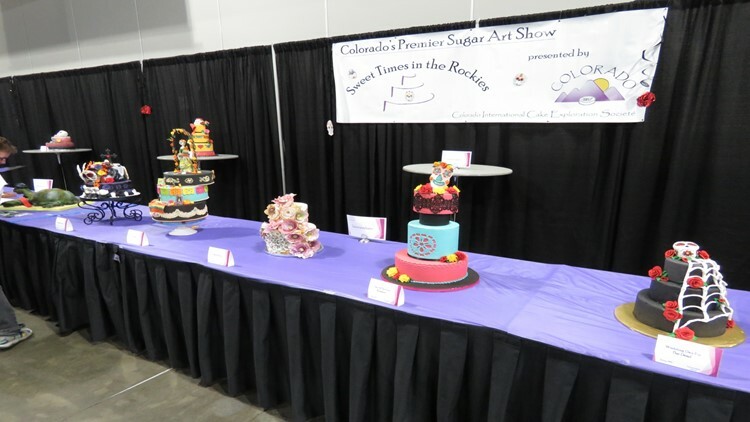 Sweet Times in the Rockies is Colorado's Premier Sugar Art Show. There are six divisions, with entry categories for kids, holiday cakes, and specialty categories. How can I participate in the fun? To get frosting colors to compliment each other, mix a “smidge” of each of the colors into one another. To make icing roses, use a Hershey’s Kiss for the center, and you’ll be able to make them a lot easier. Cake batter can be stored in the fridge for up to a week, so if you need to do everything in stages, you can! Cakes also turn out more tender if the batter has a chance to rest, to let the gluten relax. Making a cake should be fun. Bake and make frostings one day, then put it together and decorate the next. Plus, the cake will be easier to work with and less fragile if it has a chance to set overnight. If you’re having problems with crumbs in the icing, try putting a very thin layer of icing on the cake, then pop it in the freezer for 10 minutes. This locks those pesky crumbs down. If you want a filling in your cake, pipe a thick line of frosting around the edge of the cake before adding the filling. This will prevent the filling from leaking out into the icing on the side. Your icing should be easily spreadable. If it seems thick, add some liquid (a teaspoon at a time) or warm it up in the microwave until you can spread it on the cake without it peeling up behind your spatula. Cut off the rounded top parts of the cake so that it will be a level perfect cylinder. Then those scraps can be turned into “cake sandwiches” for your family – yum! Writing on a cake can be tricky. Write your message on a piece of paper (close to the edge) then hold it just over the cake while you pipe the message on the cake. This will help you keep the letters straight, spaced well, and spelled correctly. Colorado Fall Home Show is a one-stop marketplace to get ideas to remodel, refresh and renew your home. With more than 250 exhibitors well versed in home renovation, remodeling and sustainable living, this is just the place to get started as you begin preparing your home for the upcoming seasons. Exhibitors will be standing by with tips, tools and ideas on how to best winterize your home. Be sure to check out our lineup at the demonstration theater where many sessions will focus on sustainability, energy efficiency, and remodeling. THIS ARTICLE INVOLVES PAID ADVERTISING. COLORADO & COMPANY IS A PART OF 9NEWS AND FEATURES COLORADO EVENTS, COMPANIES, BUSINESS PEOPLE AND OTHER GUESTS FROM AROUND THE COUNTRY. FOR MORE INFORMATION, EMAIL US.